With the Festive Season upon us, it’s easy to partake of perhaps a little too much of the grain and grape. 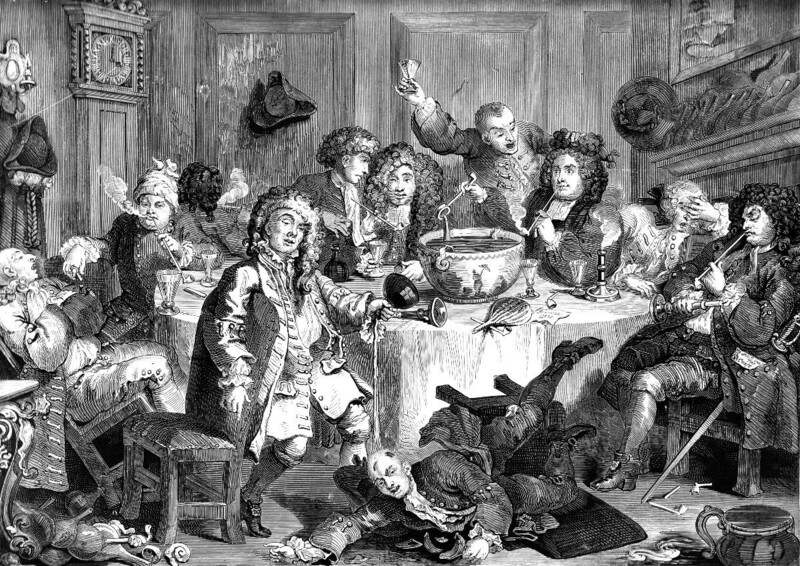 But it was punch that was often the cause of the worst thumping heads the next day, especially for members of gentlemen’s clubs. The popular ‘Regent’s Punch’ was named after the Prince of Wales. The recipe called for three bottles of Champagne, two of Madeira, one of Hock, one of Curacao, a quart of Brandy, one pint of Rum and two bottles of water – along with four pounds of raisins, sliced Seville oranges, lemons, white sugar and iced green tea. But even the Georgians would be hard pressed to beat the feat of the Right Honourable Edward Russel, commander-in-chief of His Majesty’s forces in the Mediterranean. He served a rather special punch from a marble fountain in his garden at Alicante, Spain. The ingredients included four hogsheads of Brandy, eight hogsheads of water, 25,000 lemons, 165 pints of lime juice, 1450 lb of sugar, 5 lb grated nutmeg, 300 toasted biscuits and a pipe of dry mountain Malaga. Russel had a special canopy built to keep off the rain (you wouldn’t want it diluted, would you) and a ship’s boy actually rowed around the fountain in a mahogany boat, filling the cups of the 6000 guests. When the poor lad became overcome with fumes, another took his place. Bottoms up! And all the best for the Festive Season. And to you, Peter – and all my BigJules Followers! Hey Jules…when for the next book…finishing Caribbee……….. Sorry, but not until next October… Writing as fast as I can!